A mayor's political career is jeopardized when his conniving wife goes too far. Cuckoo's Nest's Louise Fletcher plays the woman Perry must defend on a murder charge. 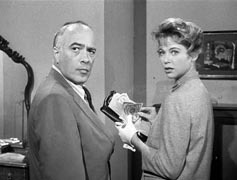 Edward Platt, the chief on "Get Smart," also stars. Goof: When Mona Henderson sees her husband and William Carter to the door of her house, she seems to be wringing her hands as if she had something on them. When she shuts the door she leaves a visible hand print mark on the door frame. Submitted by billp, 25 October 2009. Continuity: The sunlight plays some magical tricks in this show. When Mason drives up to the Henderson house at 14:37, there is a surprising amount of sunlight for an 8 o'clock appointment on an evening in March. As Henderson walks up from his car at 14:55, the trees cast early-afternoon shadows on the ground. Moments later, when Mason and Henderson meet at 15:11, their shadows fall crisply on the front door from an inexplicable light source behind them to the left. When Mason and Henderson enter the house at 15:17, you can see out the door that it has suddenly gotten very dark outside. But when Mason goes back outside at 15:30 and sees Susan Connolly's car drive away, the sun has magically returned and glints off of the trunk lid of her car. Submitted by 10yearoldfan, 10 February 2012. Continuity: When Tom Stratton, Ed Platt, a.k.a. �The Chief� on Get Smart, is examined and cross-examined, pay attention to the spectators. When the session begins, we see Mayor Henderson, Franz, seated in the aisle behind Paul Drake, and a young man is to Drake�s left. When the scene ends, Henderson has magically moved to Drake�s left and the young man has disappeared and a new man is behind Drake. Submitted by billp, 25 October 2009. + You gotta love Ed Platt's character. No matter what is thrown at him he insists he didn't do anything wrong, had no business dealings with anyone involved and didn't meet anyone at a hotel even though he knows a photo was taken of the meeting. Submitted by Wiseguy70005, 6/12/14. Sightings: Today we find the Distinguished Gentleman #1 and Distinguished Lady #4 viewing the court room action. Bill767, 1/3/16. Character Names: Mayor Henderson�s first name is Jim (as addressed by his wife). Submitted by gracep, 10/29/2010. The Mayor's name is James M. Henderson, as seen on the door to his office at 5:36. Submitted by 10yearoldfan, 2/10/2012. Arthur Tragg (Ray Collins) does not appear this episode, altough his name appears in the credits. Submitted by gracep, 10/29/2010. Location: Just an establishing shot, but that�s the Washoe County Courthouse in Reno, Nevada, shown just before the trial begins. Perry may be a little too far out of town on this case! More information here. Submitted by Craig Sundstrom via email, 4/22/2011. The opening scene features Mr. and Mrs. Henderson taking refreshment (and discussing the crime commission) with Carter, and they use the Curious Coffee Set. Submitted by gracenote, 7/4/2011. CARS. (1) Perry's black 1960 Ford Galaxie Special Sunliner, Lic No TVC 236, top down. (2) 1960 Buick Electra 4-Door Sedan, Model 4719, black, Mayor James Henderson. (3) The Getaway Car is either a (3a) 1957 Ford Fairlane 500 2-Door HardTop or a (3b) 1957 Ford Fairlane 500 2-Door Sedan. The two models look very similar, the hardtop having no B-Pillar and the sedan having a minimal one. Later dialogue between Perry and Susan says that it's a "two-tone Hardtop" "Red and Gray", making it (3a). However, I'm almost certain that this is one-and-the-same car as Ep#111's Car (1) (definitely a sedan) and that the script in this ep#107 was not coordinated with the car. See Comment below: 1957 Ford Model Names. (4) 1961 Plymouth Savoy 4-Door Sedan, Sheriff B&W, was Car (2) in preceding ep#106 and still has the Sheriff Star with Grizzly on the door. (5) 1961 Dodge Polara 2-Door HardTop, Lic No KYL 907, med color, Julia Webberly. This is the second 1961 Model-Year car to appear in PM (the first, in ep#106, is also a Chrysler product). See Comment by 10yearoldfan below. (6) Paul's black 1960 Ford Thunderbird Convertible, with Car Phone, top down. (7) 1960 Mercury Montclair 4-Door Sedan, B&W, the odd Police Star on the front door is inscribed with hexagons. Car is too extravagant for real-world police. (a) At 14:16 an all-white 1958-'62 Simca Aronde Plein Ciel (5-passenger 2Door Sports Coup�) is parked near the Henderson home as Perry arrives for his 8pm appointment. It's always been a mystery why Simca called its Sports Convertible Oc�ane but its Sports Coup� "Clear Sky". See Comments section Ep#51 for more on Simca. (b) When Perry later returns to the Henderson home a '57 Ford, looking identical to "Getaway Car" (3), is parked on the street nearby. Confusing - What's it doing there? (c) As Perry drives to see Tom Stratton (19:55-20:04) he passes a beautiful all-white 1949 Dodge Wayfarer Sports Roadster convertible, top up (same shot was seen in Ep#103). I was a bit annoyed by the discrepancy between the appearance of Car (3) versus its colors as stated in the dialogue: the "Gray" looked White. I'm wondering why the script didn't reflect how the car would appear to viewers in B&W, regardless of its true colors. Together with the Car(b) issue, the car-wrangling appears sloppy in this episode. Added by Gary Woloski, 10/1/12. + On behalf of all us vintage car lovers, let me say thanks to Gary for his most informative and comprehensive contribution as regards those vehicles. They are most evocative of the era and a big part of the show's appeal to many of us. Well done, Gary. Submitted by francis, 9/07/14. INQUIRER SPECIAL! The coin-box for the UPTON INQUIRER Morning Edition reads "PAY HERE 10�" but in the extreme close-up at precisely 18:07 the front page reads "PRICE SEVEN CENTS". This is the second consecutive episode in which three cents has been knocked off the price of the local newspaper. Submitted by Gary Woloski, 9 Oct 2012. + And as usual, the article under the headlines is nonsensical. Submitted by Wiseguy70005, 6/12/14. Closed-Captioning: Many closed-captioning errors in the CBS/Paramount Season 4 Volume 1 set including: @28:25 during Mason and Stratton's conversation the hotel room 204 is written as 2O4 (with a letter O*); a half-minute later during Stratton and Sykes' conversation it is written correctly. @32:34 during Stratton's cross-examination by Mason, the line "in the midst of what could be interpreted..." is written as "would be." Moments later the verbs in Mason's questions are written in past tense: "Did you destroyed it?" "Did you killed for it?" @41:25 during Mason's cross-examination of Mayor Henderson he answers "At about a quarter past seven" but the closed-captioning reads "At about a 7:15." @42:13 also during the cross, Mr. Stratton is written as "Mrs. Stratton" and Miss Connolly as "Mrs. Connolly." (*This is a problem with the title Hawaii Five-0 which is sometimes written as Five-O. It should always be a zero. Both series.) Submitted by Wiseguy70005, 6/12/14. After the commercial break, during Perry and Paul's carphone conversation, low music can be heard in the background but only during Paul's half of the conversation. The music abrubtly stops when Mason is shown. Submitted by Wiseguy70005, 6/12/14. + But when Perry calls Paul on the car phone, the car phone rings. It doesn�t buzz; it rings with the standard sound bite used for the landline telephones. In later episodes the car phones buzz, for example, Hudson Bradshaw's car phone in Episode #201 TCOT Frightened Fisherman. Added by Dan K, 12/7/16. When Mason is at Henderson's door he hears someone running from the back and escaping in Susan's car. Henderson is looking for his wife and then called Mason from the door after he finds the body. Oddly enough, Mason says "If someone was here in the house they must have run out the back way" as if he hadn't just seen it. Later Henderson testifies that he recognized Susan's car driving away. Even though he knew Susan may have been there, there's no way he saw the car driving away even if he was standing behind Mason (which he wasn't) because his view would have been blocked by the trees. Or is everyone just lying? Submitted by Wiseguy70005, 6/12/14. Louise Fletcher makes her second and last appearance with both times as the defendant. She was previously in the TCOT Mythical Monkeys. She looks thinner than in the other episode. Submitted by Perry Baby 9/29/15. When Perry begins his cross-examination of Tom Stratton (Ed Platt), his voice sounds hollow and stilted. Clearly he�s had to be dubbed later by Raymond Burr for some reason. Also, Ed Platt turns in a good performance in this episode. I think he was a very under-rated actor. Submitted by billp, 25 October 2009. The police matron in the courtroom is very lax in her demeanor, first sitting with her legs crossed during the morning session, then sitting casually draped across her chair on the afternoon session. So�what was is the larceny alluded to in the title? Queried by gracenote, 7/4/2011. When Julia Webberly drives up to Frank Sykes's house at 24:43, we see the license plate of her car, KYL 907. I'm sure we've seen that creepy plate before in another episode. Submitted by 10yearoldfan, 10 February 2012.
in Ep#97 on the plates of Everett Dorrell's '60 Mercury Park Lane Convertible. Perhaps "KYL 907" was a defunct pair of real plates held by the Props Dept and used on unlicensed cars. Thanks to 10yearoldfan for bringing this out! Another multi-use Lic Number is NFL 252. It is seen on the Automobile Registration forms of four different cars in episodes 77, 83, 86 & 89 (plates not seen, just the forms). Another strange license number is the UAR 076 seen on Perry's '60 Sunliner in Ep#99. Submitted by Gary Woloski, 28 Sep 2012. (3b) the 2-Door Sedan is the Fairlane 500 Club Sedan, Model# 64B. Models from "Base" to "Top-of-the-line": Custom --> Custom 300 --> Fairlane --> Fairlane 500. "Club" = 2-Door (Tudor). "Town" = 4-Door (Fordor). "Victoria" = HardTop (no B-Pillar). "Sedan" = sedan (!) (B-Pillar at center of roofline). The excellent website 1957ford.com lists 23 Ford models for 1957, excluding special vehicles. While you're there, be sure to click on "Exterior Colors" at the left and check out the paint scheme for your '57 Ford! From that site, here's a twin of this episode's Getaway Car (3), a 1957 Ford Fairlane 500 Club Sedan. Submitted by Gary Woloski, 10 Oct 2012. I thought it humorous that after Sykes' first appearance on the stand, Mrs. Webberly states that "there wasn't a word of truth" in his testimony. Then, when Sykes' was called to testify again, the judge reminded him he was still under oath! Submitted by Wiseguy70005, 6/12/14. And speaking of the judge, this case seems to have an unprecedented amount of interference - for want of a better word - from the judge in the proceedings: I don't recall any other episodes where the judge directs the prosecutor who to call as a witness (or tries to direct, for when the latter refuses, the judge himself calls her). The premise - that Perry had been deprived of an opportunity to cross-examine - doesn't make much sense, since he could have called her himself as his witness. Submitted by Notcom, 112415. In this case the DA was obviously playing games. When Perry objected, during Sykes' questioning by the DA, he also requested that "...the Court admonish the District Attorney and assign the question to misconduct." The Judge said he agreed and sustained the objection. Then he asked the DA why he wasn't presenting best evidence. The DA replied about not being able to locate Mrs. Webberly, blah, blah, blah, and then added "I will promise the Court, however, that we intend to put Mrs. Webberly on the stand..." Perry delayed his cross-examination of Sykes until after Mrs. Webberly was put on the stand, and the Court agreed. Then, when Mrs. Webberly appeared, instead of honoring his promise to the Court the DA tried to rest his case and BLATANTLY, AND DEFIANTLY REFUSED TO HONOR HIS PROMISE. This is why the Court ORDERED the DA to put her on the stand or he would. The Judge SHOULD HAVE also found him to be in Contempt of Court. My only question is whether or not the DA WAS brought up on charges of misconduct as a result. It was the DA who was COMPLETELY out of line, NOT the Court. Burger did this before, but since he did NOT PROMISE to call the witness the Court could not force him to do so. This DA DID PROMISE THE COURT. Submitted by Arisia, 03/11/18. Audio from TCOTLL can be heard on a patient tv screen in an episode of "The Bold Ones": Perry is talking to "Mr. [Mayor] Henderson"; Raymond Burr is co-listed above "Harbour Productions Unlimited" in closing TBO credits. Mike Bedard 2.27.15. I wonder how the priority in the credits was decided. Ellen Drew gets first billing but I would guessed Arthur Franz and Patricia Huston (has that Patrica Barry look) would have been listed 1 and 2. Submitted by Perry Baby 9/29/15. She (Patricia Huston) not only has that Patricia Barry look, her character has the same cold-blooded approach - the difference being that Ms. Barry could make a statue perspire, whereas Ms. Huston, in my opinion, is as passionate as a chunk of dry ice .. and talk about seeing, but NOT seeing, I just noticed that Ms. Huston played a similar role in #76 Golden Fraud, along with Arthur Franz, but not as his wife, but as the wife of the character who was competing with Franz for a position in the firm they worked for ... man, could that woman play an ice-cold you-know-what! I guess women were more genteel in those days ... if my wife were in the position of 'Julia Webberly' (Ellen Drew), she'd likely had kicked 'Mona Henderson's' little tail all the way back to her home! Submitted by MikeReese, 12/5/2016.